Toronto has an opportunity to take a giant step forward in creating clean, green, sustainable power… but this opportunity has been blocked before it even gets started. On Friday, February 11th, the Province of Ontario announced it will not allow any new offshore wind developments in Ontario. 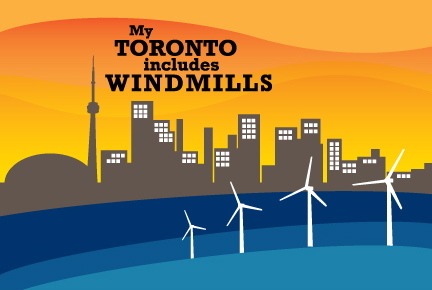 This effectively kills any future plans by Toronto Hydro to install wind turbines in Lake Ontario and provide Torontonians with clean, green power. It also creates a major gap in Toronto Hydro's long term renewable power plan that won't easily be filled by other renewable technologies. The attack against wind power in Ontario has been relentless, effective and dishonest. Wind power opponents have relied on extremely questionable environmental and health information (much of it anecdotal) to raise doubt in the minds of reasonable Ontarians who only want a healthy environment. Most importantly, what opponents fail to note is that wind is poised to replace nuclear and coal power generation, which have exceptionally dire human and environmental health impacts (see here and here, and page 5 here.) Put simply, opponents who don't want wind turbines and who do nothing to offer alternative renewable power options are dooming us to power generation that is known to kill people and harm the environment. Contact your MPP today (here) and tell them you support wind power, including offshore wind in Lake Ontario. Let them also know you support wind power because nuclear and coal generation kills people and harms the environment. In contrast, no credible evidence shows offshore wind power kills (or harms) people or hurts the environment, when properly cited.